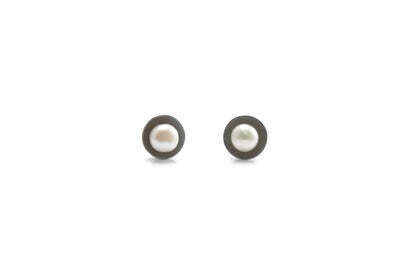 Elegant and bold, these silver pearl earrings will dress up any look. 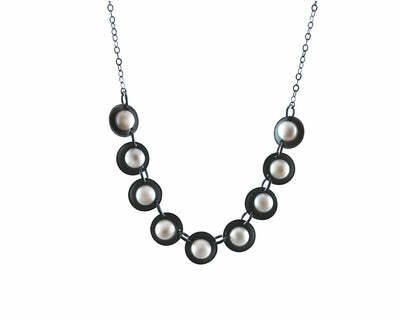 The contrasting white fresh water pearls on blackened silver will add just the right amount of fireworks to your night. After spending extensive time in the Persian Gulf doing research on the history of pearls and pearl diving, I learned to appreciate the indescribable beauty of this mystifying jewel. The pearl is brought to life through the contrasting colors which accentuate their stunning quality and feminine shape. The handcrafted result is exquisitely manifested as an adornment to your face. 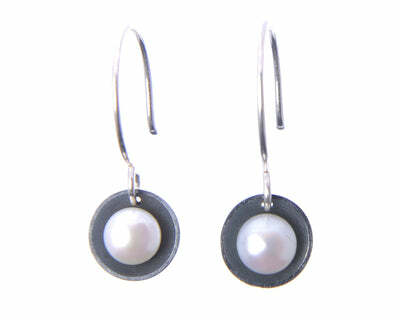 Each pearl is set in a sterling silver cup and reinforced with a silver post. They hang appx: 1 3/4" long.